The only truck-mounted mass flowmeter with over ten years of proven performance. 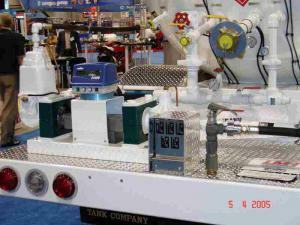 In 2002, Red Seal Measurment introduced the world’s first mass flowmeter designed to meet the rigorous demands of the LPG bobtail / minitanker environment. Since then, the advantages of this all-electronic system have been proven again and again. With no moving parts to wear out, the Neptune Series RML2000 provides dependable, maintenance-free service. The unmatched accuracy and maintenance-free reliability of the Neptune RML2000 can increase your efficiency and profitability. RML2000 mass flowmeter is NMI approved within Australia for use with all liquid petroleum gases up to 300 L/min. The Coriolis mass flowmeter provides volumetric flow measurement of LP Gas when interfaced with a Liquip electronic register. The outstanding flexibility of Liquip register gives the system an upgrade path not obtainable with competitive electronic transaction management systems. The Liquip menu-driven register functions are easy to learn and remember. Interfacing through common handhelds and laptops makes data management fast and easy between truck and office. The space-efficient RML2000 system can be implemented on both new and existing vehicles. Retrofitting is easy using existing Red Seal Measurement vapor releases and differential valves.